Have used this product and B.T. and have found Spinosad to be the most effective. Insects that I have used this product on include: Budworms, aphids, twin-spotted mites, leafhoppers, and grasshoppers. It WILL kill beneficial soft-bodied insects/predators such as praying mantis, spiders and others… but it is not a poison, and only works by contact so residual effects are null. I had a infestation of Leaf Miners on my Zinnias,peppers and tomatoes. This product proved to be very effective after other broadband insecticides failed. The spinosad organic spray had no effect on Mexican bean beetles when used as directed, even though they are one of the listed control insects. However, it was very effective against the Colorado potato beetle. After one spraying, the potato beetle larva were dead and have not returned. I had to use pyrethrin dust for the bean beetles and Neem oil for flea beetles. 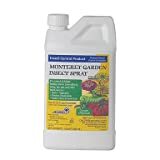 This product just plain WORKS — I have fought leaf miners for several years in my tomatoes, basil and some of the flowers, this year I tried this product. My problem is down at least 90% only the petunias are not responding as well as other plants, but still problem is down at about 75%. It also has rid me of spider mites and aphids, so i don’t have to spray for them on the roses. I even have had great luck using it on roses when mixed with Bonide FungOnil, putting recommended amount of BOTH in my sprayer and completing two tasks at same time. I highly recommend Monterey’s Sipnosad. If you have a problem with leafminers in your bushes this will get rid of them.I used Spinosad 4-5 years ago and this saved my arborvitaes. Unfotunitly my neighbors did not spray their arborvitaes and now they are digging them up. Also nice to know this is a more natural product.DO NOT USE WHEN Bee’S ARE ACTIVE THIS WILL KILL THEM!!!!! for best results Spinosan should be used early spring.